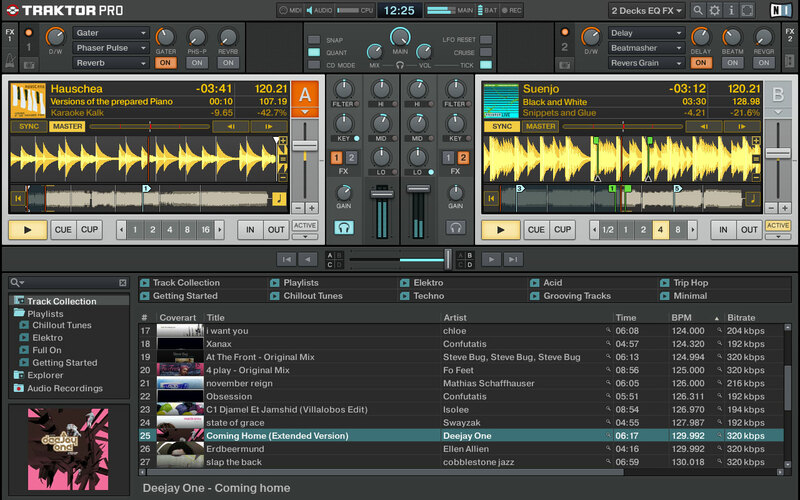 TRAKTOR PRO has become a standard in digital DJing. Mix digital files on four decks, using the high-quality internal mixer or external hardware, and the best effects suite around. Fully primed for professional use, TRAKTOR PRO redefines the art of DJing. TRAKTOR PRO sets the standard for power, reliability, and creativity in DJing. The culmination of a decade of DJ software development, TRAKTOR PRO perfectly meets pro DJs’ needs. With streamlined industry-standard workflows, 24 creative new effects, pre-assigned yet flexible MIDI mapping of all major controllers, premium sound quality and up to four playback decks, TRAKTOR PRO is in a class of its own. Remix Decks with 64 loops and one-shot samples per deck. Posted by Anonymous on Thu, 12/02/2010 - 16:36. If I were to buy Traktor pro, can I upgrade it to v1.2.6 when I have Windows 7? Posted by Jason on Fri, 12/03/2010 - 03:56. You can buy the latest version for Windows 7 now - there's no need to upgrade. Posted by Anonymous on Fri, 12/03/2010 - 06:48. Posted by Larryat24 on Mon, 11/22/2010 - 17:04. I want to make CDs mixing music now on my computer. Issue is that the volume levels of the gigabytes of different songs I have saved over the years are quite different. Back decades ago when I worked as a radio producer, we had a device that would automatically keep the volume levels the same or close to the same. Obviously there were significant issues with the technology and one needed to use it at low settings to avoid damaging the music quality. Can anyone suggest any DJ software that might address these issues. My OpSys is System 7 with strong hardware. I have used the Roxio software in the past, which has been personally useful as I now have well known software as (my opinion only) the worst software ever sold. Free is nice but not as important as will it do the job!!! Posted by Jason on Tue, 11/23/2010 - 00:59. You can either edit the recordings before you mix with them to normalize the volume levels, or if you're mixing on the fly you can use compression and normalization after you've made the recording (the first option is probably best to begin with, and then still do some mastering after you've made the recording). Posted by kj on Tue, 12/16/2008 - 09:36. Has anyone on this site ever learnt to read or write properly? Posted by Jason on Wed, 10/13/2010 - 07:22. This description of Traktor looks good to me. Posted by Stacey on Tue, 12/16/2008 - 23:37. Looks like the answer to that one is NO! Posted by Anonymous on Fri, 11/28/2008 - 16:56. I am thinking about gettin this software however I need to be sure it runs with Window Vista. Does anyone can tell me. Posted by Stacey on Mon, 12/15/2008 - 00:16.